The new Shiratech Bosch Sensor Mezzanine adds full sensing capabilities to the 96boards platform, including pressure and environmental sensors, accelerometer, magnometer and a hub sensor for design and evaluation purposes. The Mezzanine can be Zxtended with additional functionality through the built-in expansion connectors. These allow you to plug-in additional mezzanines as needed. Additional sensors and peripherals, like a USB camera, can be connected to the 96Boards USB ports to enhance context awareness capabilities. The Bosch Sensor Mezzanine is compatible with the 96Boards consumer edition (CE) products. BMP388 – Digital pressure and temperature sensor based on proven sensing principles. The sensor enables accurate tracking and is specifically suited for drone applications. Connected to the Snapdragon via SPI interface and 1 x GPIO line. BMA456 – An16 bit , digital triaxial acceleration sensor with intelligent on-chip motion-triggered interrupt features optimized for wearable applications. Connected to the Snapdragon via SPI interface and 3 x GPIO lines. BME680 – A digital 4 in 1 sensor with gas, humidity pressure and temperature measurement based on proven sensing principles. Target devices for this sensor are handsets such as mobile phones, tablets, PCs and GPS devices. Connected to the Snapdragon via SPI interface and 1 x GPIO line. BHI160 – A small , low power smart-hub with an integrated three axis gyroscope plus an integrated three axis accelerometer plus a programmable icrocontroller. Containing pre installed software and specific algorithms for activity recognition. It is specifically designed to enable always-on motion sensing. ultra low power smart sensor hub incl integrated imu. BMM150 – A stand alone geomagnetic sensor for consumer market applications. 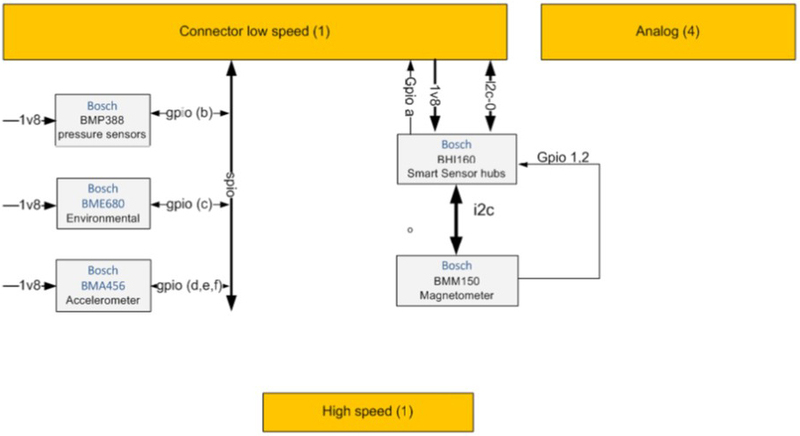 It allows measrments of the magnetic field in three perpendicular axes, based on bosch’s proprietary flipcore technology, connected to the smart sensor hub BHI160 via I2C interface and 2 GPIO lines. , low power smart-hub with an integrated three axis gyroscope plus an integrated three axis accelerometer plus a programmable microcontroller.